Watch this! We haul an abandoned 1963 Chevy Impala SS 4-speed out of the woods 40 years after it was left for dead. 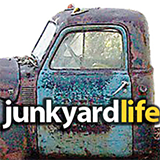 The Junkyard Life Rescue team, led by Keith Lively, hustled into action in the backwoods of Alabama. All it took to rescue the onetime gold Impala SS was a chainsaw, a monster Jeep and a tractor. The Impala SS was among a small hoard of mostly Chevrolet iron that was abandoned in the 1970s after their engines were snagged for roundy-round racing. The stash included a 1970 Chevelle, several Vegas, one Chevy II and a 1967 Bel Air 2-door post. All were hauled home and will begin a new life as parts cars or projects for us or someone else. We’re super proud of the 1963 Impala rescue because it is a true SS with bucket seats and a 4-speed. Score! Keith worked all angles for a couple of years before connecting with the property owner to earn permission to retrieve the cars. But, he did it! And the Impala has tons of great parts and even a spare set of bucket seats in the trunk. We want to see this classic brought back to life! Stay tuned. Read about another car that was among the abandoned finds in the woods: A 1970 Chevelle!